When George Mitchell, timber seeker, arrived on the eastern shore of Little Clam Lake (later Lake Cadillac) in 1871, two events that year led him to establish his community quickly at the site. The Great Michigan Fires that swept across the state from Saginaw and Port Huron westward to Manistee and Holland destroyed or seriously damaged many of the timber harvest areas and lumber mills. Also the northward extension of the Grand Rapids and Indiana Railroad had reached a point a few miles south of his village site. Mitchell immediately faced two challenges that needed to be addressed in order to successfully build up the area. First, he successfully convinced the G. R. & I. to redirect the construction of their railroad headed for Charlevoix and Petoskey sharply eastward when it had reached a point only three or four miles south of Little Clam Lake. The intended and most direct route was between the two lakes. Secondly, he dredged the easterly flowing Black Creek connecting the lakes to float the harvested timbers from the Big Clam Lake area (later Lake Mitchell) to the mills in his village. He failed that challenge so the following year he began constructing the canal a few hundred feet south of the creek. Mitchell noted that the prevailing westerly winds and, more importantly, the natural flow of the water to the Clam River outlet at the northeast corner of the smaller lake, would be ideal for floating cut timbers to his mills. With this ability, it is no wonder that the area was built up into a booming lumber community. The lakes are fed mostly by the vast acreage of wetlands around their shores. It has since been found that the lakes recycle their waters in slightly more than one year, making them much like a slow moving river. That constant flow carries away many undesirable organisms and contaminants. It takes most inland lakes in Michigan at least 10 years for a complete water change, therefore the makeup of the lakes makes them some of the cleanest in the area. From the beginning, Clam Lake became a tourist destination. At least three boat companies carried tourists and local residents to the shores of both lakes for picnics, berry picking, and hiking. One company carried tourists to a lakeside mill where guests boarded a Shay Locomotive for a ride in the forest. 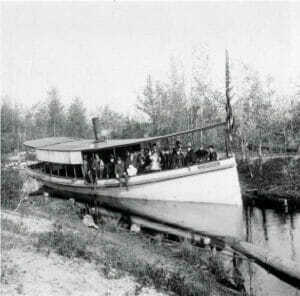 As early as 1873, a steam powered flatbed scow transported passengers to the north shore and on to Idlewild, the forested area between the two lakes. The train rides quickly turned into quite the experience, featuring food, music, and dancing during the journey. 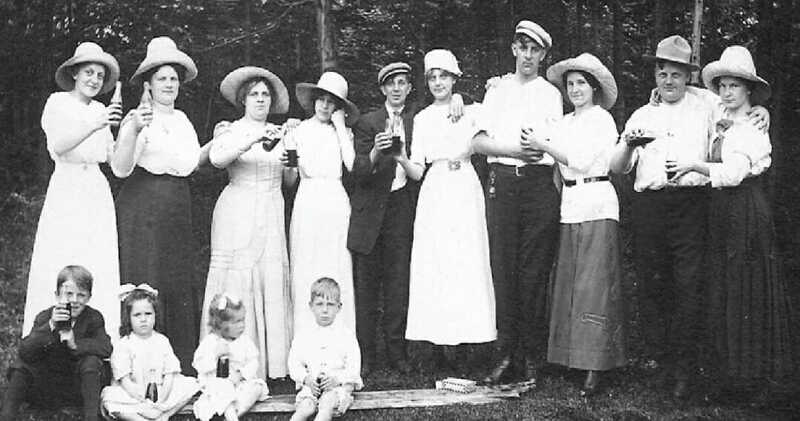 During those first summers, several trains arrived daily carrying tourists to that “social” town on the lakes. The G. R. & I. sold $16 round trip tickets from Cincinnati. A tourist excursion in the 1880’s brought over 500 huckleberry pickers to visit a Cherry Grove Township marsh area. In 1884, an excursion train of 14 filled cars arrived from Toledo, Ann Arbor, and other Michigan communities. Later 600 tourists from Grand Rapids arrived for boat rides, a ball game, and dining in local restaurants.  More recently, Cadillac has become an important boat-manufacturing center. 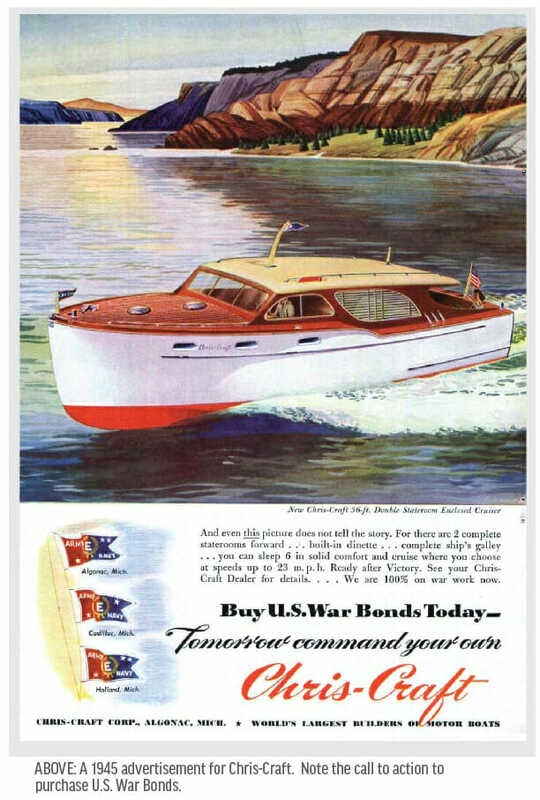 Soon after the Chris-Craft Boat Company was established in 1941, it retooled its production of pleasure boats to LCVPs (Landing Craft Vehicles and Personal) for military use in both European and Pacific World War II zones. The company made over 2,000 of the large landing craft and was awarded the US Navy pennant, “E” for Excellence. Following the war’s end, the company made and shipped pleasure boats throughout the world, including one for the president of Egypt. The Winn family, including the father and his three sons, began making fiberglass recreational boats in 1962 under the Four Winns brand name. That company has since expanded by adding the Glastron, Wellcraft, and Scarab brands and is now known as Rec Boat Holdings, LLC. The company was recently purchased by a large French boat manufacturer, which gives RCB a worldwide customer base. If not for the 2 lakes, the canal, and some far-sighted and caring business and political leaders, Cadillac might have become another ordinary town. When the large mills ceased operations during the 1920’s and 1930’s, much of the valuable shoreline property was left to the community. City leaders of that period wisely converted a two-mile stretch along the northeastern Lake Cadillac shore for the Keith McKellop Walkway and park. The William W. Mitchell State Park and the Kenwood Park and Beach provide visitors and locals several pleasant venues to relax and enjoy. The early lumber barons made a lot of money and they invested much of it back into the Cadillac area. With its two beautiful lakes and easy access to several hundred thousand acres of state and federal forests that feature camping sites, streams, lakes, and hills, Cadillac remains a favored destination for those who seek solitude in a wide variety of natural settings.